The Onkyo TX-SR706 is the company's ﬁrst THX Select2 Plus receiver, whose main distinguishing feature from plain vanilla THX Select is THX Loudness Plus. This transpires to be an umbrella term for two technologies. One, called THX Multichannel Spectral Balancing, adjusts the frequency response of individual channels to counter the loss of presence at the frequency extremes, which is referred to a nominally 'flat' balance at a so-called Reference level – a smart loudness control in fact, which begs the question just how smart can any loudness control be? The other THX technology, Dynamic Ambience Preservation, preserves spatial detail (aka imaging) when listening below the previously mentioned Reference Level. In combination, they amount to the latest iteration of the THX standard, albeit in its smaller-room- dimension Select2 incarnation rather than the full-bore Ultra2. The Onkyo also features Audyssey Dynamic EQ, which does broadly the same job as THX Loudness Plus. But where THX Loudness Plus is only available in one of the THX modes, the Audyssey counterpart is available in all non-THX surround modes. But this is only the beginning of the Onkyo's capabilities, which by any standard represents a well- endowed package for the price. All video sources including standard-cooking quality DVD can be upscaled to 1080p using the Faroudja DCDi Cinema algorithm. The Onkyo also includes a full implementation of the Audyssey room acoustic correction – even the obligatory microphone boasts Audyssey branding. It's a very effective process, which in the not-too-distant past was limited to Denon's receiver range. The all-important power ampliﬁ ers share the internal architecture used on the top-of-the-range Onkyo receivers (a three-step inverted Darlington circuit from the 876), albeit with a reduced power output beﬁ tting its lower price. Other beneﬁts include Onkyo's proprietary WRAT (Wide Range Ampliﬁer Technology) and the improved isolation of pre- and power amp stages. Power output is rated at 160W-per-channel but this is to the slack IEC standard at 6Ω. In real money, output is probably closer to 100-110W/channel, but in practice there's plenty of power for most reasonable circumstances with all channels under drive. The preamp section, with its attendant video and DSP, is located near the front panel, and the power amps are locked close to the speaker terminals, which should and does add up to a cleaner, more sharply demarcated sound. Naturally, iPod connectivity is built in, and so are decoders for DTS-HD Master Audio and Dolby TrueHD – which almost goes without saying. 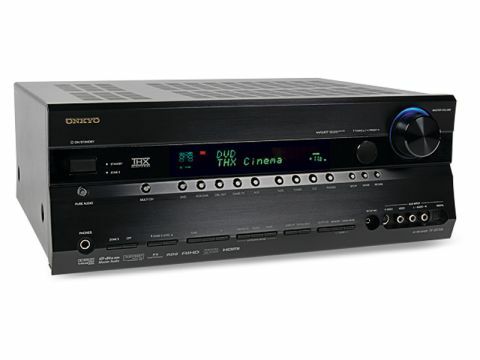 Oh, and in addition to a raft of interconnections, the Onkyo boasts no fewer than four HDMI inputs and one output, all version 1.3a compliant, with included CEC control allowing data and instructions to piggyback the HDMI signals, reducing wiring complexity in some systems. The SR706 is a receiver, so there's a built-in tuner. It's an FM/MW model with 40 presets, but there's no sign of DAB radio. From my point of view that's no disadvantage, given what I consider the poor overall sound quality performance of the format compared to FM, though I acknowledge DAB has its fans. The 706 also has a high current power supply, to ensure that it can take transients in its stride, plus the ability to bypass unnecessary circuits (Direct mode and Pure Audio mode). It's also possible to 'bi-amp' the main stereo speaker pair for 'audio-ﬁrst' applications. In use, the Onkyo TX-SR706 turns out to be hard to fault at its price level. It is a notable clean, open, and often vivid-sounding design, one that sounds comfortable in its own skin, even when being driven hard, underlying that the real world power that the Onkyo can muster is more impressive than the raw numbers suggest. That the Onkyo is not a full-fat THX Ultra2 receiver is probably a plus point in practice, as most users in the UK would gain little by trying to utilise Ultra electronics in a typical living room. The Audyssey acoustic tuning algorithm means that the Onkyo can be effectively ﬁne-tuned to match most speaker conﬁgurations. Driving my reference Mordaunt Short Performance speakers and a much-loved Mission subwoofer, none of which are THX-approved, the system seemed happy to sing and dance. The fact that the subwoofer was only being asked to plug a relatively small window in the frequency response, and that it did so with tunefulness and discretion, was undoubtedly impressive, and the result was a system that was able to perform consistently with a single voice. Ideally of course, the AVR should be matched with THX-certiﬁed enclosures, but most users are unlikely to have these to hand unless they are putting together a fully- integrated THX system from scratch. Image-steering is excellent with Dolby and DTS sources alike, as long as the system has been ﬁne-tuned. This will take time to get right, and works best when the speakers are not too close to the preferred listening position. There was a tangible sense of multichannel sparkle – a spring in its step – that worked with a wide range of ﬁlms, though as often happens, the best sense of reality was with material that was neither too loud not too quiet: high-brow Euro nudefest Swimming Pool provided a great stomping ground that didn't put the system under too much pressure, though the Onkyo was good enough to get the adrenalin racing in high-octane ﬁlms like Kill Bill, and to cope with the subtleties in such titles as Lord of the Rings. Overall, the Onkyo TX-SR706 is a ﬁrst-rate medium-power/mid-priced receiver that has been designed to make the most of a variety of source material, rather than simply maximising the numbers. It has a well judged set of features, particularly the Audyssey room correction and THX Select2 post processing, which ensures that the output is reasonably kosher without the slugging of output dynamics and speed that can give home cinema bass output a bad name in some quarters. The Onkyo TX-SR706 delivers most of the features and real world power that most of us reasonably require. Cinephiles looking for an affordable receiver with high-end aspirations are advised to form an orderly queue.